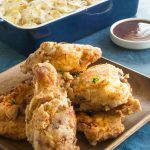 This No fail Crispy Southern Fried chicken recipe gives you crunchy coated chicken that is both juicy and seasoned with just the right flavors. Step by step instructions on how to achieve perfect fried chicken every time for BBQ’s, picnics, or casual dinners. Todays recipe is for Southern Fried Chicken is a family recipe that is tried and true. Its super flavorful because you season the crunchy coating as well as brine the chicken before cooking so it stays really juicy after frying. We have made this recipe since I was a child, it’s from my Grandma Oma who really knew how to do things right. 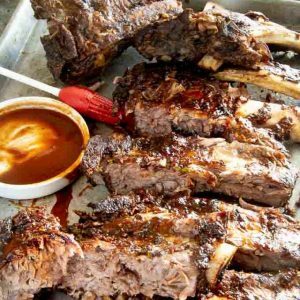 It works as an easy comfort food meal for entertaining guests for a BBQ or dinner party. But it also works for taking in a picnic basket. I love that it holds up even when its cold! Making the Best fried chicken isn’t hard. You need only follow a few simple steps to achieve a super crunchy chicken that has lots of flavor. 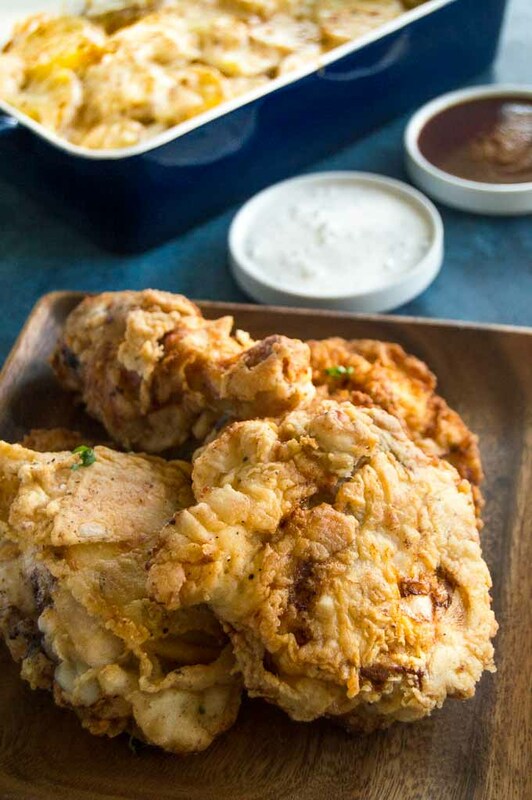 Using a few spices or seasonings in the flour mixture combined with the extra step of brining the chicken get you off to a great start of the tastiest fried chicken you’ll ever have. What is the best way to brine chicken for frying? What is a brine? A brine is a method to soak a meat in a salted water so that the meat absorbs more water. 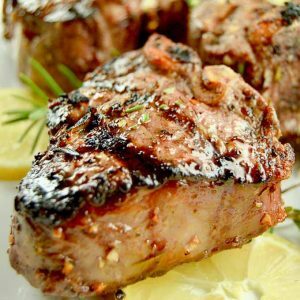 When you are cooking meat, the heat breaks down the fibers and you lose some of the natural liquid in the meat during cooking. If you brine a meat with salt and flavorings before hand, you essentially add more liquid to the meat than it originally had so that when you are cooking it even though you still lose some juices, the meat still keeps more because there are more in all of the fibers. Brines always have salt and water in them. But other flavorings and seasoning can also be added in such as sugar, hot sauces and spices. Depending on the size of the meat (in this case chicken) and whether the pieces are whole or cut up determines both the amount of salt and how long you can leave it in the brine. For example chicken strips without skin should be left in the brine for a shorter amount of time than a whole chicken would. What seasoning to use in southern fried chicken? When making the flour to dip the chicken in you can use any of the herbs and spices above. Alternatively, you can just use salt and pepper but feel free to make it your own. How to make crispiest fried chicken? My favorite part of fried chicken is the extra bits of crunchy coating or crispers as we called them in my family. 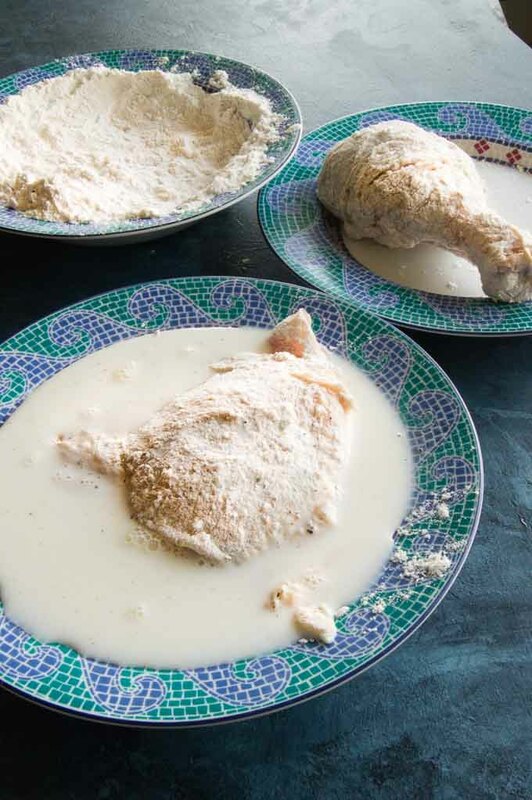 To get the crunchiest fried chicken you will want to dip them twice into the seasoned flour and milk. (DOUBLE DIP METHOD) Set up a dipping station so you are going in order from flour, to milk (and back again) then have a plate to place them on to set. My tip for having the crunchy coating stick to the chicken? You’ll want to let the double dipped chicken rest for a minimum of 10-15 minutes before frying to let the coating set to the chicken. It also allows the chicken to come closer to room temperature so it cooks more evenly. Which is the best pan to fry chicken in? A cast iron skillet or an electric skillet work the best for getting even cooking. You can use other pans but be mindful if the pan gets hotter in one area and move the chicken around accordingly. What kind of oil to fry chicken in? Nothing is worse than soggy chicken. There are several ways to avoid this. To begin with choose the right oil. You’ll want to use an oil with a high smoking point such as lard, shortening, canola or vegetable oil. Many people suggest peanut oil, but sometimes that leaves a peanut taste in the chicken so I tend to avoid that. Oils to not use for crispy fried chicken are olive oil and avocado oil. They start to smoke really quickly and then your chicken can taste burnt. When you place the oil in the cast iron skillet you want to only pour enough in so that it comes up about to just over half the width of the chicken. You will be flipping the chicken so you’ll get the sides cooked evenly. What temperature to fry chicken at? Heat your oil to 375° before adding your chicken. 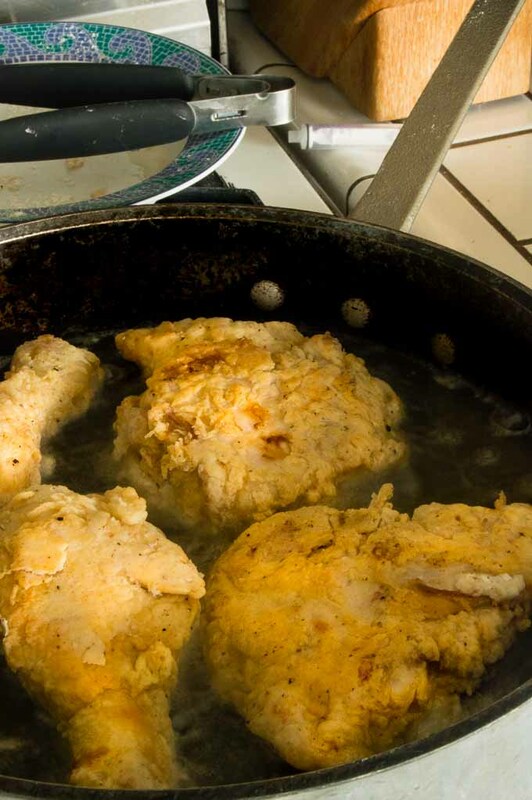 You want to make sure the oil is hot enough or when you add the chicken a lot of the oil will absorb into the flour giving you soggy, heavy tough chicken coating. If you don’t have a thermometer thats ok too. My grandma never did but she used the flour test method. You’ll make a flour milk ball and drop it in the oil to test if it is hot. The small ball (about half the size of a pea) when dropped into the oil should immediately start to bubble rapidly and float to the top in just a few seconds. If it does that the oil is ready for the chicken. Additionally when you add the chicken to the hot oil you’ll want to leave about 2 inches in-between so the chicken can cook evenly. If you place them too close together there is a chance the oil wont cook the sides and there could be raw section. How long to cook fried chicken? Southern Fried Chicken is done when the chicken is white (no longer pink) and the juices run clear. Its hard to give a hard and fast time when giving instructions as the size of the chicken is a huge factor. Cut a breast in half so its closer in size to the thighs. Bone in will take longer than if you use boneless. I use a fork to cut into a couple of pieces to make sure they are white and the juices are running clear. When the crispy fried chicken is done cooking place it on a wire rack to cool. You can still place a paper towel underneath the wire rack to absorb the excess oil but you don’t want to let the chicken actually touch the paper towel. This will give you the BEST crispiest chicken ever! Is there a way to make healthy crispy southern fried chicken? This is the number one question on fried recipes that I have on my site. While there are ways to cut down on the calories such as using skinless chicken when frying fried chicken and making sure the oil is the right temperature so the coating doesn’t absorb any more oil than necessary there really is no way to have super healthy fried chicken. 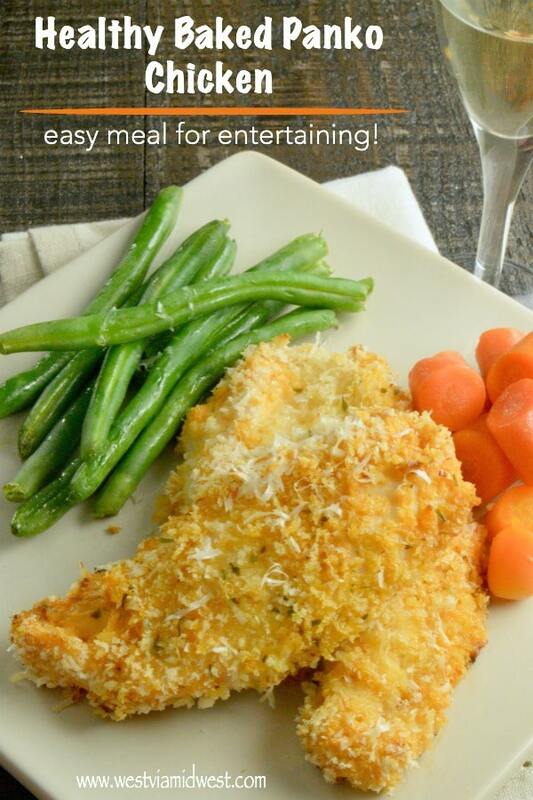 I do have a great baked “fried” chicken recipe here that is a lot healthier if you want to go that route! What to serve on your picnic or bbq with your southern fried chicken? Homemade Buttermilk Ranch ~ great to dip the chicken into! 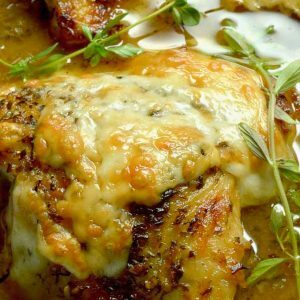 PIN THIS TO YOUR CHICKEN BOARD OR EASY DINNER RECIPES FOR ENTERTAINING BOARD so you can find it easily when you need it. In separate bowl combine water, 1/2 cup milk and salt for brine mixture. Stir until salt and sugar is dissolved. Rinse chicken and place in bowl. Put chicken in brine mixture and soak for at least an hour, can be done the night before as well. Mix flour, salt, garlic powder, onion powder, pepper (both) until blended on large platter or baking dish. Pour milk in medium bowl. Remove chicken from Brine Mixture, rinse and return to same bowl. Set up a dipping station (see notes) chicken, milk then flour. Using one hand only dip chicken in milk, then flour mixture, then repeat milk then flour. Dip all pieces in the flour and milk mixture. Allow to rest for a minimum 10 minutes to allow the flour mixture to fully set to chicken. Put oil in your frying pan. You want a shallow amount so it will come up to about 3/4 the way up the chicken. (I estimate 2 cups, but it will depend on the size of your frying pan. Heat oil to 375°. Or use the test method below if you do not have a thermometer. Once oil is hot drop a test piece of flour/milk piece to test temperature. Oil is ready if when you drop the flour mixture in it immediately rises to the top. Place chicken into skillet/pan. Do no over crowd. Allow 1-2" between pieces for even cooking. As you are adding the chicken be sure to add it in going away from you so if there is any oil splashes it splashes away from you. Once all chicken is in the skillet reduce heat to medium-high, just a little bit. You want to cook on a lower setting so that the chicken has plenty of time to cook. If you fry it at too high a temp, the coating will brown and could burn before the chicken is cooked. Fry turning at about every 10-15 minutes. Chicken with the bones in them take longer to cook. The chicken is done when the chicken is solid white and no pink remains, the juices run clear and there is no pink cast to them. I always test a piece by cutting into to it with a fork to make sure the chicken in completely cooked before removing all chicken from the skillet. Remove chicken to wire rack over a cookie sheet with paper towels under the rack for oil to drip down to. Fry as many batches as you have chicken. Allow to cool for at least 10 minutes before serving. 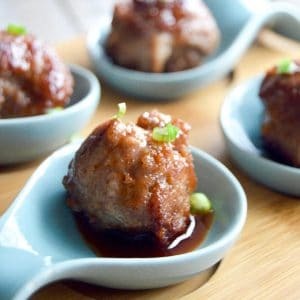 Chicken can be served at room temperature or cold too if you wish to make it early in the day and save it in the fridge. I would list all 4 that you were to be paid for in February and say my invoice only shows I was paid for 3 of the 4 and youre not even sure which one is not included.... I listed the dates mine went up and just asked for clarification. Set up an assembly line of the order you will be dipping your chicken. In this recipe The chicken is set up farthest from the skillet, then the milk, then the flour mixture. The goal is to work your way to the skillet that it is going into with as little area to spill as possible. It is really important to not put chicken into oil that is not hot enough. If you do this, it gets very oily. If you make sure to test the oil with flour pieces ahead of time you will avoid greasy chicken. Once all pieces are added to pan, leave at high until you can see the rolling bubbles of the oil before turning it to medium heat. This is also the reason for frying in small batches, if you overcrowd the pan, the oil temp will be too low and leave you with greasy chicken. If you want to use bone in chicken the only thing you need to do is cook them longer. When cooking whole pieces, the breast takes the longest to cook, the thigh and the leg a little less and a wing the shortest. When Im cooking chicken pieces with bones in them I usually cook the breasts in once batch, the legs and thighs together and then finally the wings. By like pieces in batches it is easier to make sure that the pieces are cooked perfectly. This sounds so good! I’ll have to try it. Don’t need eggs in the milk??? Ooh I need to try this out! I always order the fried chicken (and waffles) when we go out for breakfast, but I have never made it like this at home. I am lazy and have been using the air fryer for mine, but I am sure this method tastes a lot more indulgent! I love fried chicken, but I actually never make it myself. I am so glad I found this because the tip about brining is mind blowing! I looooove fried chicken and these look amazing! The skin looks perfectly crispy. Grandma’s are the best at cooking without thermometers! I’m always so impressed but I rely on my instant read one. 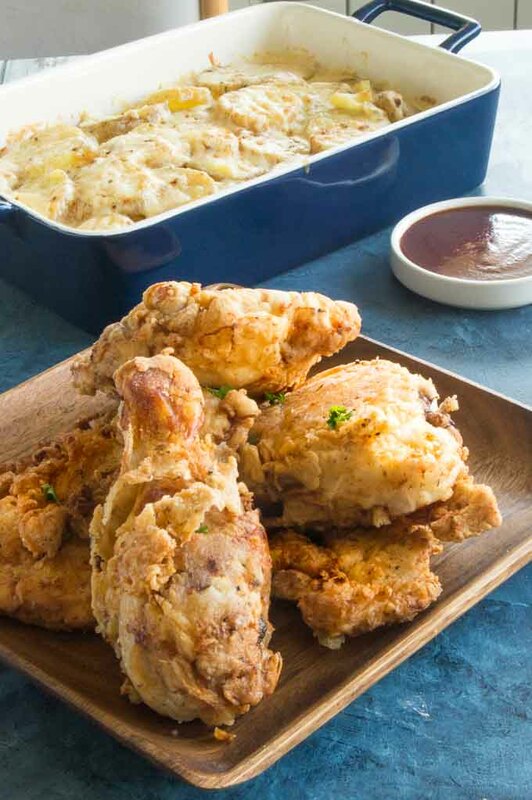 You just threw down the mic with this fried chicken recipe. It really IS perfect and I was nodding my head the whole time reading your post, which was so detailed and helpful! I haven’t made fried chicken in a bit because you’re right, there really isn’t a way to make it all that healthy, but when it’s a special occasion, I’m all for doing it the right way. And my husband’s birthday is coming up and this IS his favorite food, so I think it’s time to bust out that frying pan! The chicken looks delicious and seasoned perfectly. My mamma would always bone out the chicken — so the chicken would fry faster. Your method is a lot like the way my sweet MIL would make it. Now, she didn’t add those delicious seasonings to her flour. We will have to try out your Grandma’s way. I’m not craving fried chicken. I love a good detailed tutorial! So nice to see all the helpful tips and tricks here – after all, we all love fried chicken, and we all hate getting it wrong! ~~~there’s a lot of great info here, and it looks like a real keeper of a recipe. Cheers! 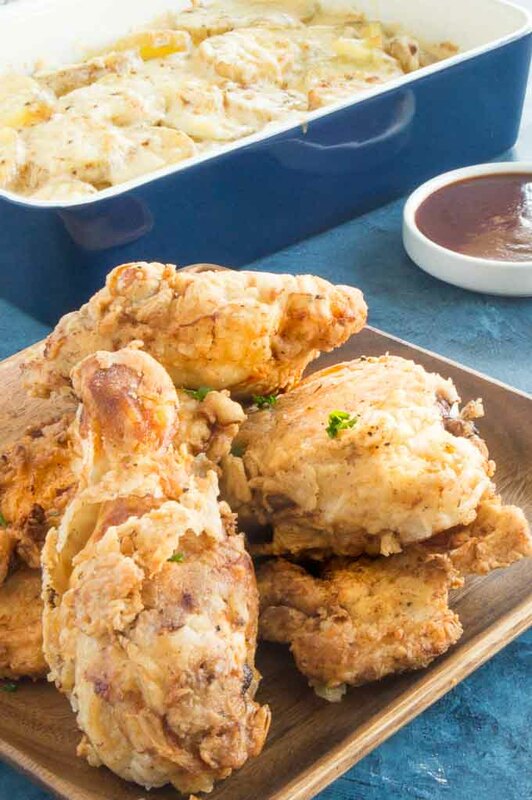 You totally made my day when you said that this recipe for Perfect Fried Chicken holds up to a cold picnic basket. I so love the idea of cold, crisp fried chicken on a picnic, but whenever I’ve tried to make my own, it ends up a soggy mess when it’s cold. I’m super excited to try your recipe this summer! I’ve never fried chicken before, and it never would’ve occurred to me to brine it first! (We always made “shake and bake” chicken wings when I was little.) And I also wouldn’t have thought to put the paper towel UNDER the drying rack- that’s so clever! You can bring these to one of my parties any time! Shake and bake is another favorite way for me to have chicken! That sure made me smile when I saw it! Hope you give the recipe a try! My stomach just growled!! I love fried chicken, especially when it’s nice and crispy. I so wish I were having this for dinner tonight! I love the idea of adding herbs and other flavors to the brine. What a great way to infuse additional flavor into the meat. What a perfect recipe for a picnic! I really need to give this a try. I NEVER get fried chicken when I am out. I have always found it too greasy. Making it at home would be so much better for sure. This for sure is a crowd pleaser. Better make lots. Southern fired chicken is pure love. Love your crust. It is perfectly browned and looks very crisp. Cannot wait to try. I LOVE Southern Fried Chicken and yours is pure perfection! I love the crispy bits and all your tips – especially the ones from your grandma! Grandma’s really know best! I really wish I could reach in and grab a piece! Just amazing. Simply the best chicken ever!